Getting a box full of goodies designed specifically for you is a great to brighten your day. There's nothing better than a good care package, whether you're making one for a friend or receiving one yourself. I've always loved grab bags and remnant racks, so the recent surge in subscription-based curated sites has been fun to watch. I see spending a few dollars for a monthly surprise as an investment in happiness. For this week's Live a Little Monday, I thought I'd spotlight some of my favorite, in the hopes of inspiring you to make one or gift one to yourself. And I'm finally going to mail the care package that I've been meaning to ship to my friend Kathleen before her younger son was born. Which means it's been sitting in my office for almost a year. 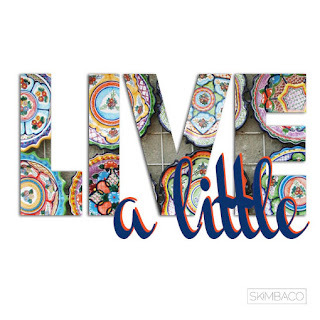 Part of my new Live a Little attitude is to own up to and deal with my shortcomings. Like excessive tardiness, for starters. What do you like to give or receive? Share your Live a Little suggestions with the Skimbaco community every Monday by adding the link to your Live a Little blog post in the InLinkz widget below. Rules: Link either to Skimbacolifestyle.com OR grab the InLinkz code for your blog post – or do both! If you post the widget in your blog post, please add the rules as well. Very cool idea. I haven't sent a care packAge in forever but I had no idea that you could buy something like that Eco box. I think that is a steal! I want one! Thanks for sharing. Ok.. that looks awesome!! And I want that PS. I made that book!! I love eco friendly products, this looks like a great gift idea.